Midway through Frank Capra’s film, Mr. Smith Goes to Washington, the corrupt power brokers, scheming to enrich themselves through a federal dam project, realize the ‘stooge’ they hand-picked to be a U.S. 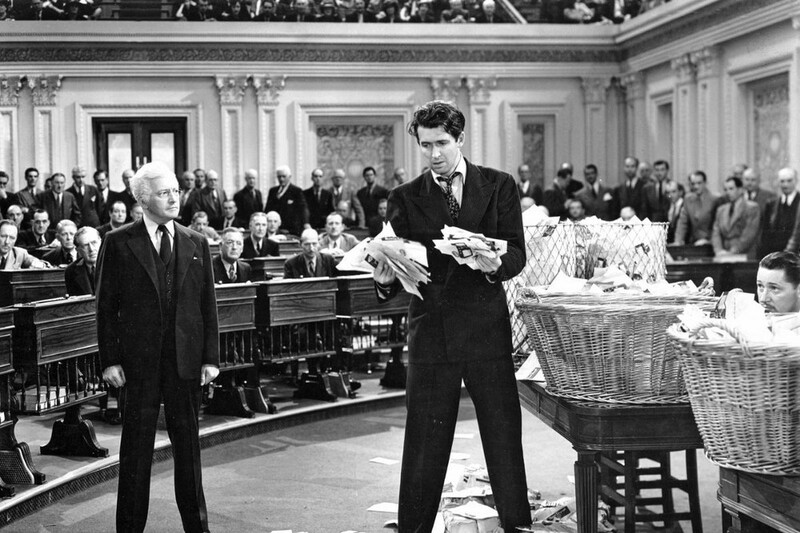 Senator, Jefferson Smith (played by James Stewart), wasn’t just honest, but willing to expose their illegal plan. How do the power brokers plan to stop Senator Smith? After Senator Joseph Paine and Governor “Happy” Hopper, both from Smith’s home state, along with party boss and media magnate Jim Taylor, conspire to frame Smith in a similar land-sale enrichment scheme, Smith is forced to defend himself on the floor of the U.S. Senate. In one of the most iconic scenes in Stewart’s film career full of iconic scenes, Smith filibusters for close to 24 hours on the Senate floor, in the hope that the media’s coverage will generate support for his defense. Using his control of the media, newspapers, and radio in Smith’s home state, Boss Taylor does just that — “SEND SMITH TO JAIL WHERE HE BELONGS,” implores a radio announcer — and, in the final scene, basket loads of anti-Smith telegrams and letters are poured onto the Senator floor. As Smith starts reading the letters, he collapses in despair, ending his day-long filibuster. If I had written the movie, it would have ended right there. But this is a Capra movie and as Smith is lifted out of the chamber, a guilt-stricken Senator Paine confesses to his colleagues (and the nation) his own guilt and Smith’s innocence. If only the real world always worked out that way. Today, the Senator Paines are on CNN, MSNBC and Fox News offering live commentary from the Capitol’s rotunda as Senator Smith is carried away. The modern world of politics isn’t as oafish and thinly-veiled in its deceit as a Capra movie and Jimmy Stewart doesn’t win — not often at least. We are watching in real-time today a similar dynamic, with even greater (negative) consequences, should the mainstream media succeed in its brazen and surprisingly uncloaked attempt to smear and impugn the character of Hawaii Representative Tulsi Gabbard, who is currently running for the Democratic presidential nomination. There is no other presidential candidate running today, besides Bernie Sanders and possibly Elizabeth Warren, with as clear a message as Gabbard’s: End our counterproductive regime change wars. I don’t know what policies or ideas Kamala Harris really supports. Or Beto O’Rourke? And Howard Schultz? He says he wants a centrist Democrat nominated, whatever that means. Who are these people and why should anyone be excited about their candidacies? But, for some reason, the mere mention of Gabbard’s name can turn a gaggle of temperate Democrats into an seething, tweet-raging mob. I know the fundamental reason for the rage. Gabbard betrayed Hillary Clinton at a moment in the 2016 Democratic nomination race when the momentum had finally shifted away from Sanders and back towards Clinton. In late February 2016, Gabbard went on national TV to announce her resignation from a Democratic National Committee leadership position on the grounds that the nomination race was rigged against Sanders and that she could not support the leading candidate, Clinton, due to her long, well-documented history of poor judgment, particularly with respect to the use of U.S. military and diplomatic power (2003 Iraq War, destabilizing Libya, destabilizing Syria, etc.). That is why NBC, MSNBC, CNN, Vox.com, Politico, The Washington Post, The New York Times, The Daily Beast, The New Republic, Vanity Fair, The Nation, and many more news outlets, smear Gabbard. They think she’s a traitor. It has hurt Gabbard’s effectiveness in the U.S. House and eliminates any possibility (as remote as it already was) that she will win the 2020 Democratic nomination. Still, I pray she can find a way to stay in the race as long as possible. This country needs to hear what she has to say. Even if she only makes it to the first major debate in June, Americans will hear a thoughtful argument on why, according to Gabbard, U.S. regime change wars in the Middle East and elsewhere have done harm to our nation’s broader security interests — not to mention the immense harm done to innocent civilians living in these countries. Good intentions, including some genuinely good deeds we’ve done in Syria, Iraq and Afghanistan, are not sufficient reasons for imposing America’s will on foreign countries where U.S. strategic interests are not at stake, says Gabbard. That is not a radical argument, by any definition. Kentucky Senator Rand Paul makes it pretty much every day to anyone willing to listen. But — and I regret saying this — the Republican Party has a higher tolerance for dissent among its ranks than do the Democrats. Yes, Rand Paul has been marginalized within the U.S. Senate on matters related to national security. But when they need Paul’s support on other matters, there is no hesitation to welcome him back into the GOP-fold. That is not how the Democratic establishment is dealing with Gabbard. They are openly using a three-stage strategy to end her national ambitions: (1) smear, (2) isolate, and (3) and ignore. When Gabbard, without permission from the House leadership, visited Syria (and met with Syrian dictator Bashar al-Assad) during a congressional break, on her return the Democratic establishment trotted out their attack Chihuahua, former Vermont Governor Howard Dean, to accuse Gabbard of being sympathetic to dictators and the use of chemical gas attacks on innocent civilians. That Gabbard has consistently labelled Assad a “ruthless dictator” has been ignored by her critics. That she believed any punishment of the Assad regime for gas attacks should not have happened until international observers, such as the Organisation for the Prohibition of Chemical Weapons, had independently determined culpability is also ignored. Gabbard has never denied that the Assad regime has employed gas attacks on its own citizens, but you wouldn’t know that if you watched CNN or MSNBC. The national news media routinely gaslights Gabbard…because they can…with impunity. Their most recent smear of Gabbard was perhaps the most dishonest. In a poorly-sourced story relying entirely on a Democratic Party-aligned communications firm, NBC news suggested Russian intelligence agents — presumably the same crew that interfered in our 2016 election — have decided to back Gabbard in 2020. The Intercept’s Glenn Greenwald gives a detailed autopsy on how this deplorable NBC story came to life. Suffice it to say, nothing in the NBC story was reliable or trustworthy. It was simply a partisan hit job propagated by a Democratic Party-friendly news network. “Today, our freedoms and democracy are being threatened by media giants ruled by corporate interests who are in the pocket of the establishment war machine. When journalism is deployed as a weapon against those who call for peace, it threatens our democracy as it seeks to silence debate and dissent, creates an atmosphere of fear and paranoia…This danger is not new — we saw it take hold of our nation during the last Cold War, as McCarthyite hysteria. Stories like NBC’s against Gabbard are the perfect smear. No American journalist is going to invest the time — much less have access to — the Russian sources behind this story. The fact the smear comes from known Democratic hacks gives the appearance that it is a non-partisan attack. Gabbard, after all, is a Democrat. It all stays in the family. Furthermore, Trump, Russiagate, and our military adventures are profit centers for the national news media. Why would they let someone like Gabbard piss on their money parade? When Gabbard recently appeared on MSNBC’s Morning Joe to talk about Syria and other regime change wars, they gooey condescension coming from Joe Scarbrough, Mike Brezinksi, Washington Post columnist David Ignatius and easily MSBNC’s worst show host, Kasie Hunt, was palpable. When Hunt tried to confront Gabbard on Syria, she exposed herself as ill-informed. Apparently, many Americans like Hunt are unaware that, today, the U.S. is not fighting Assad’s Syrian forces. We are in Syria fighting ISIS, controlling Syria’s most lucrative natural gas fields, and trying to keep the Kurds, Turks, and Assad’s forces from fighting each other. But, Hunt, having been embarrassed by Gabbard before a national audience, resorted to what any good MSNBC on-air personality does when outed as being nothing more than a corporate tool— she re-tweeted the NBC news story smearing Gabbard for allegedly being a Russian tool. I don’t believe in a vengeful God, but sometimes I pray I’m wrong and there is an especially dark place in Hell for MSNBC’s current on-air talent pool. As for David Ignatius, has he ever been on the right side of foreign policy debate? From Iraq WMDs, the Iraq War, Libya, Honduras, Yemen, Syria, Russia, Iran, and soon, Venezuela, he has always been wrong, very wrong, and inconceivably stupid wrong. You have to work hard to so consistently make that many bad calls. Even Tom Friedman laughs at David Ignatius’ track record. The NBC/MSNBC smear campaign against Gabbard is particularly insidious because it dovetails nicely into the current Russiagate zeitgeist that continues to consume and paralyze the Democratic Party — that part of the Democratic Party, at least, not associated with Alexandria Ocasio-Cortez and concerned about addressing problems such as climate change, health care, and income inequality. When Gabbard was first elected to Congress in 2013, she was a rising star. In an almost unprecedented opportunity for a new House member, she was placed on the prestigious House Armed Services and Foreign Affairs committees and had a important role within the Democratic National Committee (DNC) heading into the 2016 election. Unwilling, without a fight, to let a warmonger with a history of bad judgment become the party’s 2016 presidential nominee, Gabbard resigned from the DNC and declared her support for Bernie Sanders. Even more than her opposition to the military-industrial complex’s love for regime change wars, opposing Hillary Clinton was Gabbard’s most unforgivable betrayal for many Democrats. She became the party’s “Sal” Tessio. But Gabbard put principles ahead of career and that decision’s consequences include what we are seeing today. The Democratic Party establishment wants her isolated and marginalized and are using their propaganda division— the national news media — to do it. In fairness, the party elites’ trust in Gabbard was always on a provisional basis. Gabbard, a Hindu, was raised in a socially conservative, pro-life family in Hawaii. Her father, Mike Gabbard, born in America Samoa, was (and still is) a conservative Democrat that in the early 2000s, along with Tulsi, openly opposed marriage equality (as did Barack Obama, Joe Biden, and Hillary Clinton at the time). And, similar to those prominent Democrats, Tulsi Gabbard’s position on marriage equality (and abortion rights as well) evolved in a progressive direction over time. As a House member, Gabbard has had one of the party’s most progressive voting records on LGBTQ and abortion rights issues. Gabbard’s attitude shift — as she tells the story — centers on her experience as a military officer during the Iraq War. In my career, having conducted research for the U.S. Office of the Under Secretary of Defense for Personnel and Readiness on soldiers’ attitudes during their service careers, what Gabbard talks about in her transformation sounds familiar. Serving in the military and exposed to a broader cross-section of Americans than from where they are often raised, soldiers frequently develop more progressive views on race, ethnicity and gender issues. It is the nature and demands of military service that prompts this attitudinal change. It is human nature. In other words, it is wholly believable Gabbard’s views on LGBTQ issues changed during her time in the military. But, apparently, among brie-and-wine progressives at Jacobin magazine, Vox.com, and Vanity Fair, Gabbard’s evolution is untrustworthy and most likely the cover story of a party saboteur. Hillary Clinton’s conversion on marriage equality — on the other hand — totally credible. Besides being placed on Nancy Pelosi’s naughty list, Gabbard has been substantively isolated within her own party through her removal from the House Foreign Affairs Committee in the current Congress. That may be the single worst thing that has happened to Gabbard since 2016. When the country needed to hear Gabbard’s voice during the House Foreign Affairs hearings on Venezuela this past week, we watched the committee largely roll over for Trump’s regime change adviser Elliot Abrams. A while I admire the sharped-edged, earnest grit of Rep. Ilhan Omar’s questioning of Abrams, Gabbard’s confident, polished demeanor was absent. Frankly, Gabbard didn’t help her relationship with Pelosi or her standing in the party when she voted against the new House rules in January that included the PAYGO requirement. [Gabbard, Ro Khanna and Alexandria Ocasio-Cortez were the only Democrats to vote against the new House rules.] But, by that point, Gabbard’s outsider status was already hard-coded into the Democratic Party establishment’s lizard brains. 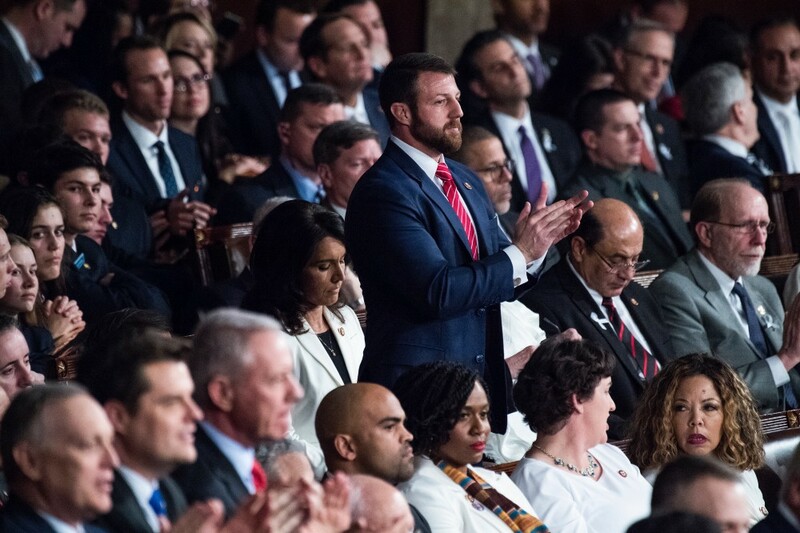 If you need evidence of how far the Democrats will go to isolate Gabbard, you need only have watched Trump’s last State of the Union address. 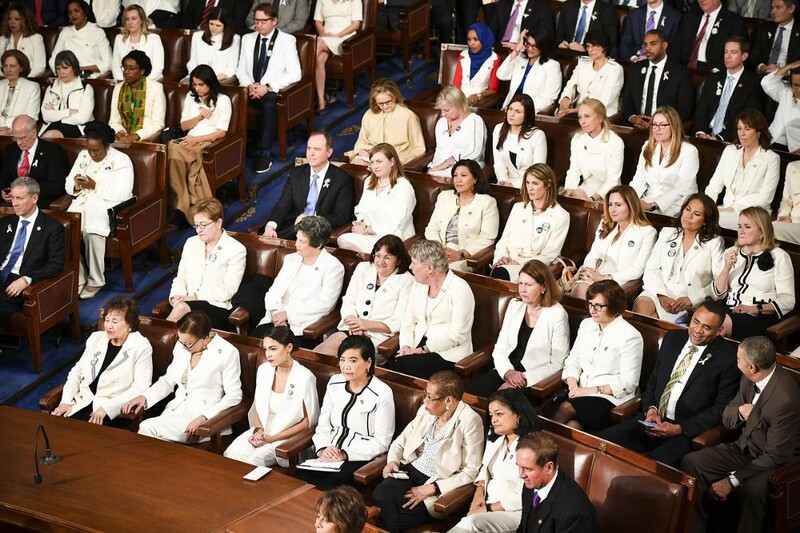 As the Democratic Women in White took their seats near the front of the House chamber, Gabbard was so far in the back she was one row away from being in Pittsburgh. AOC, in contrast, earned front row status in the stink-eye brigade. And I understand why AOC was willing to join this oddly high schoolish-level display. Its good for her congressional career. I’m good with that. But, AOC should know this: Push for substantive legislation on health care and the Green New Deal and they will drop you as if they caught you cheating with their boyfriends. As for Gabbard, now that the party has effectively smeared and isolated her, the last step is to ignore her and hope she goes away. Pretend she doesn’t exist so her donors dry up and she is forced to drop out of the presidential race — maybe even become a Republican. As The Jimmy Dore Show pointed out recently, MSBNC’s Steve Kornacki didn’t even mention Gabbard when talking about the early polling for the 2020 Democratic nomination. Granted, Gabbard’s poll numbers are in single digits; that is, when the pollster actually lists her among the candidates. CNN and the Emerson Poll didn’t even bother to list her name for respondents in their December 2016 polls, even though it was known she was planning to run for president. And when Gabbard was listed by the Emerson Poll in late January, her two percent support was similar to two far better known candidates, New York Senator Kirsten Gillibrand (1%) and Minnesota Senator Amy Klobuchar (1%). FiveThirtyEight.com’s first video on the 2020 Democratic nomination somehow couldn’t find room for a picture of Gabbard on its title screen, but somehow Oprah and The Rock deserved spots and at least six other faces that I don’t know who the hell they are. Michael Avenatti?! But don’t feel sorry Gabbard quite yet. Iowa could be the antidote for a negligent and biased national media. Among the first states to revolt against the railroad barons at the turn of the 20th-century and home to progressive, Henry Wallace, FDR’s prvice president from 1941 to 1945, Iowa has a strong populist, anti-interventionist streak. And based on her first visit to the Hawkeye State, Gabbard’s anti-regime change message resonates. Her first scheduled event in Fairfield drew an auditorium-filling crowd of at least 200 people and her foreign policy-focused stump speech had solid applause lines. Gabbard also connected with an Iowa audience when she talked about the religious bigotry seemingly growing again among some Americans. Her concern about religious bigotry is a crotch-kick at some in her own party’s leadership that now openly questions whether practicing Catholics are qualified to sit on a federal bench. Even the neoliberals at Bloomberg winced at Feinstein’s implication. Her interrogation of Coney Barrett is the modern form of the same anti-Catholicism that kept Al Smith from becoming president and easily could have ended John F. Kennedy’s presidential ambitions. Thank God we’ve advanced as a nation…except, that we haven’t. Iowa Democrats will be open to Gabbard’s message on religious tolerance as they tend to be both progressive and religious. They aren’t San Francisco liberals. Iowans are also unpredictable and sometimes even ornery — polar vortices will do that to people — but they will listen and have been known to lift previously unknown candidates into national prominence (e.g., Jimmy Carter) and knock down front runners just as readily (e.g., Howard Dean). More importantly, Gabbard’s Navy officer training and discipline helped her connect extremely well in the smaller group settings while in Iowa. As a citizen on the outside looking in, it is obvious the mainstream media and Democratic Party elites do not want Gabbard in this race. To the Democratic Party establishment, Gabbard is the most dangerous candidate possible. She is at odds with her party that has spent the last 30 years trying to make up for its failure to get credit for the fall of the Soviet Union — the greatest U.S. foreign policy achievement since World War II. Carter started the arms buildup, but Reagan received the credit. The Democratic neolib/neocons will never let that happen again. Gabbard rejects the standing assumption within the political-military establishment that regime change wars are a legitimate and morally righteous use of American military superiority, regardless of the damage it inflicts on civilian populations. Iraq, Libya, and Syria are a living testament to this policy’s deep flaws. And when Gabbard stands on that stage for the first debate in June, she will be the only candidate confidently standing against these counterproductive wars. Senator Elizabeth Warren, the only other Democratic to make definitive statements against U.S interference in Venezuela, is simply not as dedicated as Gabbard on this issue. There are legitimate arguments against Gabbard’s views on U.S. regime change wars. If someone believes 4,000 American troops in eastern Syria is going to save Syrian and Kurdish lives and lead to the final defeat of radical Islamic terrorism (or, at least, the land-holding ISIS variety), they are entitled to that opinion. And they should feel free to debate Gabbard and others that share her views — but they should do so on the merits of their arguments. I hope this country gets to hear Gabbard’s thoughtful message over the course of the 2020 campaign and I hope her critics are equally prepared to respond in a constructive way. To instead smear her as a Russian stooge, or worse, as a simpatico agent of murderous dictators, is not just inaccurate, it is immoral. This is the type of lazy journalism that is now standard operating procedure at the major cable news networks. But, to be well-informed citizens, we need to hold these news organizations — and I use the word ‘news’ lightly here— to a higher standard. There is real dissent on how best to use American military, economic and diplomatic power in a world still populated with far too many despots and evil-doers. But this dissent does not come from the radical fringe of American society or from a secret Russian plot to neuter American power (which is what the Russians openly do anyway because that’s kind of their job!). Anti-war dissent comes from an American mainstream that is not adequately covered by our corporate news media because they are, in fact, suppressed. Anti-war advocates don’t make money for media companies as do Trump and war. That is the media system we live with today. I don’t know when corporate interests completely absorbed our journalists and news organizations. It may be impossible to know when it happened. Or maybe it has always been that way and we are only now realizing it. What I do know is that American news organizations are not just bad, they are dangerously bad. And if the news media is allowed to kill off the Gabbard presidential campaign before she has an opportunity to share her views with voters, this country will be lesser for it. Let us not allow party bosses like Capra’s fictional Jim Taylor shut down another honest politician.